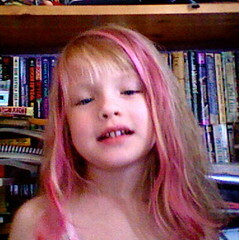 For the first time since the summer, we've re-dyed Pari's hair her usual choice of Cupcake Pink. Thanks to the blond genetics, no hair stripper is needed, so we just apply the dye and it's good for months. The picture was taken with my laptop, and edited with iPhoto, which I'm looking forward to replacing with Photoshop Elements in about a week. I don't think I'll let Katie see this picture. She's all about pink. I like the color on her. And her school doesn't care about hair dye in the kids, which is great.